3.8 out of 5 based on 49 bloggers and 7 commenters. 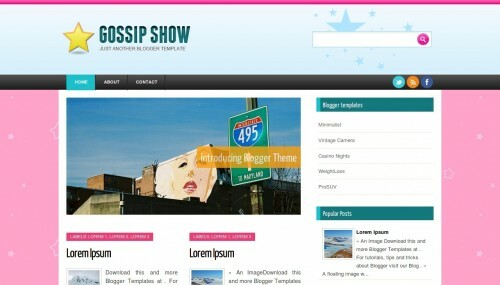 Gossip Show is a free blogger template with 2 columns, right sidebar, fresh look, an exclusive design for Blogger, footer columns, slider, social bookmarking icons, posts thumbnails and girly looking. Excellent template for blogs about entertainment, movies or music. @Samantha N: Read the instructions (click on the links above highlighted in yellow). My thumbnails get stretched out to fit the 80×80 size in the template. I tried to take out the widt or height but this makes the thumbnails very large. Can anyone tell me how to hold the thumbnail 80×80 but leave the picture as it is? I have some problems installing this template, I downloaded it just that the logo is in another folder and file can not put a yellow star with the title, ie I am not the star. Another problem is the social networks do not think at all the HTML codes to put my facebook, twitter and RSS. The slides also do not think the code to put my photos. I’ve read all the instructions on the template, but I can not! I can’t install this template on my blog! can someone do this 4 me?